Metal Samples offers corrosion test racks used to mount coupons and secure them directly to operating equipment or within a process system. Corrosion test racks make it easy to evaluate how corrosion would effect differing alloys and material finishes under identical conditions. Rack usage helps eliminate coupon loss which might occur if samples were individually placed in a process flow. Corrosion test racks can be fabricated to meet your requirements for material and size. 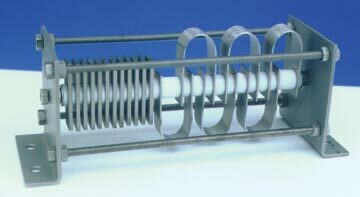 A variety of insulators, washers, and spacers used to isolate coupons can also be ordered separately. Each specimen location should be identified by sketch and recorded. The corrosive media should have access to the coupons. 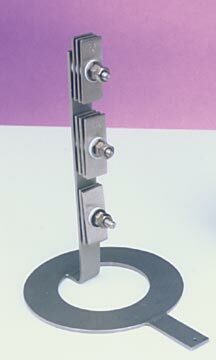 The test rack should have adequate corrosion resistance to endure the test. Specimens should be electrically isolated from other metals unless galvanic effects are being studied. Specimens should be located in easily accessible areas. Also see Insulators, Washers, and Spacers. Contact Metal Samples Company sales department for pricing and availability.